Friday’s 2-1 win over the St. Louis Blues brought the Dallas Stars elation, a sigh of relief, and an important move up the Western Conference’s crowded ladder. Joy from the momentous victory was quickly washed away, though, in a 5-2 lopsided loss to the Sharks on Sunday. Dallas still sits ahead of St. Louis for third place in the Central Division — but only by way of having one game in hand. The Stars have now dropped two of their last three games, and they’ve been outscored 11-2 in those matchups. Vancouver blasted the Stars in Dallas, 6-0, last Sunday. One week later, a Sharks squad playing without its longtime leader, Joe Thornton, jumped all over Ken Hitchcock’s team in San Jose. 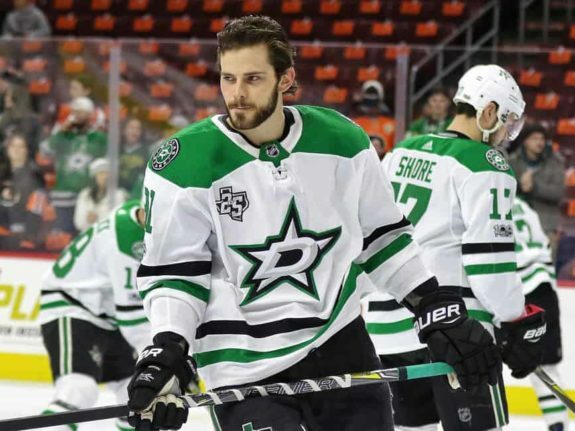 The two defeats have exposed some of the Stars’ weaknesses — deficiencies they’ll have to shore up if they hope to remain planted in a competitive playoff picture. Dallas has struggled to get going early in games recently. Both the Canucks and the Sharks buried the Stars in the first period in the last week, outscoring Dallas by a combined 8-0 total after each game’s opening 20 minutes. The Stars dropped to 10-16-3 when allowing the opposition to light the lamp first. Four of those wins came on the Stars’ recent five-game winning streak to begin the month, including a massive come-from-behind victory over Pittsburgh. That magic has clearly dissipated in recent fixtures. The Stars also fell to 6-13-3 when trailing after the first period. Conversely, Dallas is a staggering 24-5-1 when finding the back of the net first and a near perfect 16-1-1 when leading after one frame. In last week’s game against Vancouver, the Canucks scored 2:11 into the game and piled it on from there. The Sharks registered a tally just 27 seconds after puck drop and recorded three more in the first. After the most recent loss, Hitchcock told reporters that he’s “having a difficult time getting (his players) to dig in” when it comes to setting the tone physically. Hitchcock blamed the uneven play on his guys’ unwillingness to check and impose their will out of the gates. He added that this has been an issue for an extended period now despite the Stars’ recent climb up the standings. 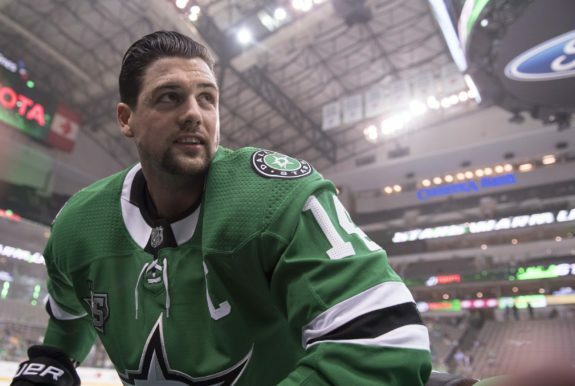 Dallas has been bailed out by exquisite goaltending on multiple occasions, but Ben Bishop forgot to pack the edge he used to guide Dallas to victory over the Blues. The Sharks chased him from the crease after he allowed four goals on five shots. Kari Lehtonen continued his hot play in mop-up duty, stopping 22 of the 23 shots he faced, but the damage had already been done. Entering Sunday’s tilt in San Jose, the Stars had some road momentum. They had earned points in six straight games away from the American Airlines Center, going 5-0-1 in that span. That came to a crashing halt against the Sharks, which shouldn’t be a surprise given the Stars’ collective road woes throughout the season. Dallas is an elite home team with its 21-9-1 record at the AAC. But the Stars are a mere 13-12-3 away from home, even with their mini surge heading into California. Dallas still has to face Anaheim and Los Angeles — potential playoff teams making trade deadline moves while jockeying for position in the Pacific Division — on its current western road swing. Oddly enough, the Stars play the same three Californian teams on the road in the same order during the final three games of the regular season. Though there are many games to be played between now and then, this current road trip serves as a decent indicator to how Dallas might fare against the Sharks, Ducks and Kings in early April when points will surely be at a premium. Before then, the Stars face a ruthless stretch in which they’ll play seven of eight contests on the road in mid-March. They’ll lace up the skates in Nashville, Pittsburgh, Montreal, Toronto, Ottawa, Winnipeg and Washington D.C. from Mar. 6 to Mar. 20, with one home game against Anaheim mixed in the middle. To hold Dallas’ current spot in the standings, Hitchcock surely needs to figure out how to get his players to “dig in” away from home.